Maple syrup production is a traditional and increasingly prevalent practice in the Northern Forest that yields a popular sweetener, generates jobs, provides income, and maintains the working landscape. Its long-term viability depends on the sustainability of annual sap extraction from maple trees. Tapping and extraction of sap must not damage more wood than can be replaced by annual tree growth or extract enough sugar resources to reduce growth rates and hinder replenishment of functional wood. To meet these requirements, maple producers generally follow tapping guidelines found in the North American Maple Producers Manual (Ohio State University, 2006). However, modern, high-yield sap collection equipment and practices (tubing and vacuum systems) extract at least twice the volume of sap per tree than was possible with the technology used when the guidelines were developed. Have these tapping guidelines remained sustainable for use with today’s high yield operations? 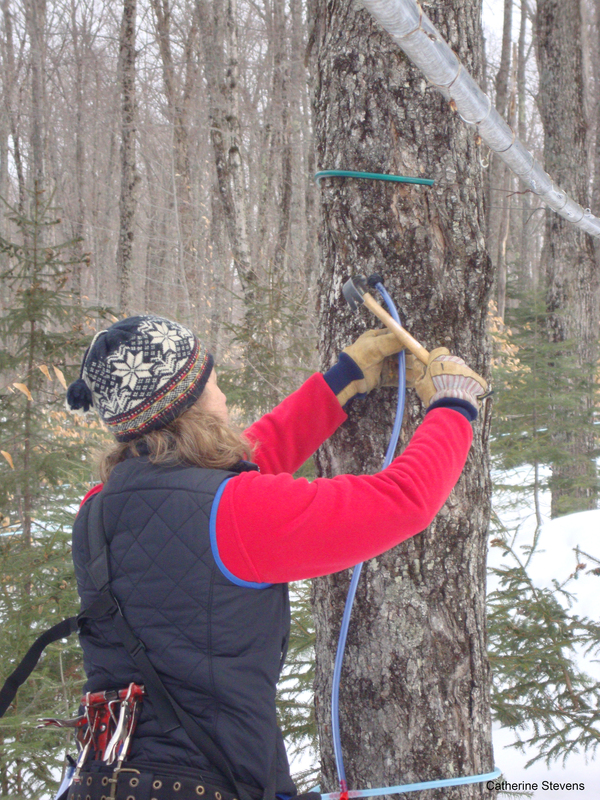 In a study funded by the Northeastern States Research Cooperative, researchers at the University of Vermont’s Proctor Maple Research Center in Underhill Center, Vermont, determined that, for healthy overstory trees, existing tapping guidelines remain a sustainable approach for collecting sap using high-yield practices. In this study, estimated minimum annual growth rates needed to replace enough functional wood ranged from 1.4 in2 in 10-inch trees to 2.6 in2 in 18-inch trees. Average growth rates of healthy overstory trees across the sites ranged from 1.8 (+/-0.2) in2 per year in 10-inch diameter trees to 3.5(+/-0.3) in2 per year in 18-inch diameter trees. These findings suggest that growth rates observed for trees tapped with high-yield sap collection practices were well over the minimum rates required for tapping to be sustainable using current maple industry tapping guidelines. However, these recommendations apply only to healthy overstory maple trees 10 to 12 inches in diameter or greater and growing on good quality sites. There is another side to the story. An average of 35% of trees in the study had growth rates below the estimated minimums. Smaller, subcanopy trees tended to fall into this category. If producers adhere to current guidelines, tapping trees with these lower growth rates would more likely result in an accumulation of non-conductive wood in the tapping zone, reduced sap yields, and negative impacts on tree health. These findings indicate that tapping practices should be modified for some trees to ensure adequate replenishment of conductive wood. The researchers suggest that maple producers measure tree growth rates to be certain that tapping practices are sustainable. Consulting, county, or extension foresters can provide assistance. They also recommend regular thinning in sugarbushes to encourage vigorous growth of crop trees and continued sustainability of tapping and sap extraction. A user-friendly model that estimates the proportion of nonconductive wood in the tapping zone over time is available on the Proctor Center’s website.